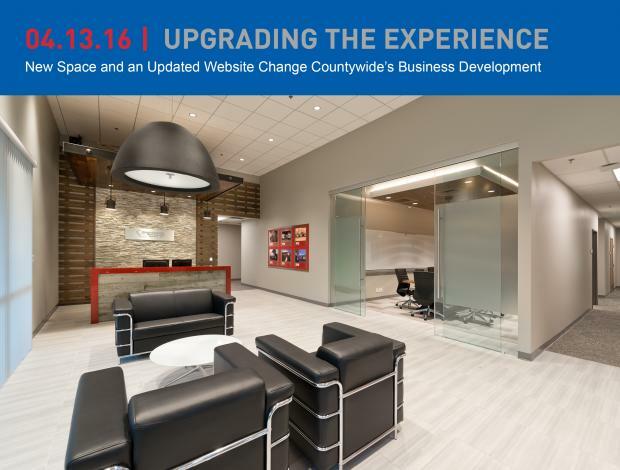 Countywide Mechanical Systems has experienced a whirlwind of transformation since beginning our journey to move into a new building and launch a new website. One of the most exciting things about the changes is that it's more than just external — with our space and our website, we can now serve clients better. More space means increased capabilities, both in the office and in the prefab shop, and a fresh website helps showcase these capabilities to better inform current and potential partners. After signing the lease in May 2015, demolition began that July with a very aggressive construction schedule to get us moved into our new space by December. We were set to grow into our new 24,000-square-foot facility, compared to our previous space, which was 14,000 square feet. One of the most exciting pieces of our new facility is our new prefabrication shop. We went from a few covered parking spaces serving as our shop to an 8,000-square-foot shop and warehouse equipped with a 2-ton crane and the latest in pipe fabrication tools. As the design of our new facility took off, our MMC Corp marketing team was simultaneously beginning the process of redesigning our website. It would ultimately match the look and feel of our new building and really begin to solidify Countywide Mechanical’s brand in San Diego and throughout California. We have redefined the markets that we want to be known for, and the new website helps us tell that story to our clients. Our new building and website are truly changing the way we do business. Clients are starting to see the strong and consistent brand of Countywide Mechanical Systems, and they are excited to do business with us. And perhaps more important than the clients are the people that want to become a part of the team at Countywide. It is the people that represent Countywide every day both inside and outside of our walls. We are getting the attention of talented people throughout San Diego who want to work for Countywide — yet another benefit to our clients stemming from our investment in providing an unparalled construction experience on each and every job.